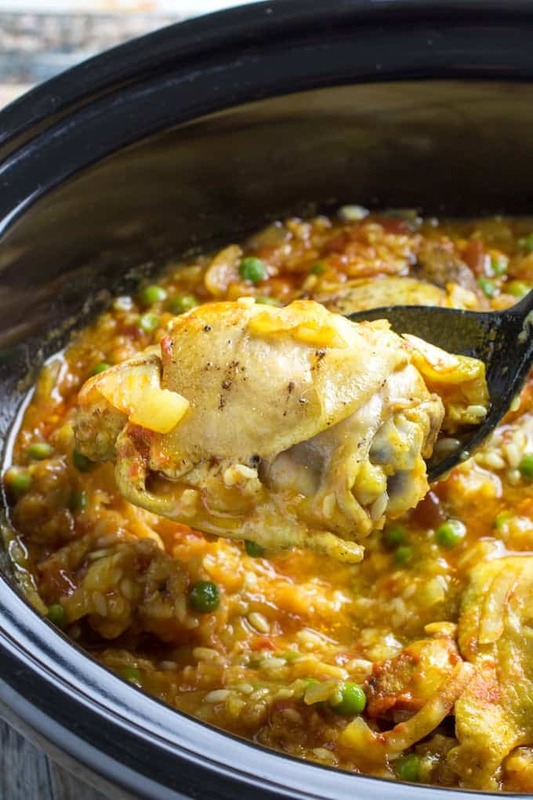 Slow Cooker Chicken and Sausage Paella is an easy dinner with a ton of flavor. Chicken thighs and spicy sausage slow cooked with arborio rice, peas, and spices. It’s the perfect dinner to come home to after a long day! I am all about easy dinners that take almost no time to throw together. If you’re in the same mindset, you’ll probably love my Slow Cooker Honey Garlic Chicken, Slow Cooker Chicken Marsala, and Slow Cooker Pork Chops & Potatoes. 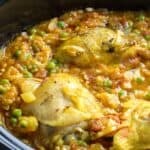 Slow Cooker Chicken and Sausage Paella is tender chicken thighs and spicy chorizo with a flavorful arborio rice and veggies mixture. It’s one of those really satisfying yet simple dinners that you can throw together in a pinch. As an added bonus, you have the convenience of letting the slow cooker do its thing while you take care of some much needed R&R. That’s the good stuff, right there. How do you make traditional paella? 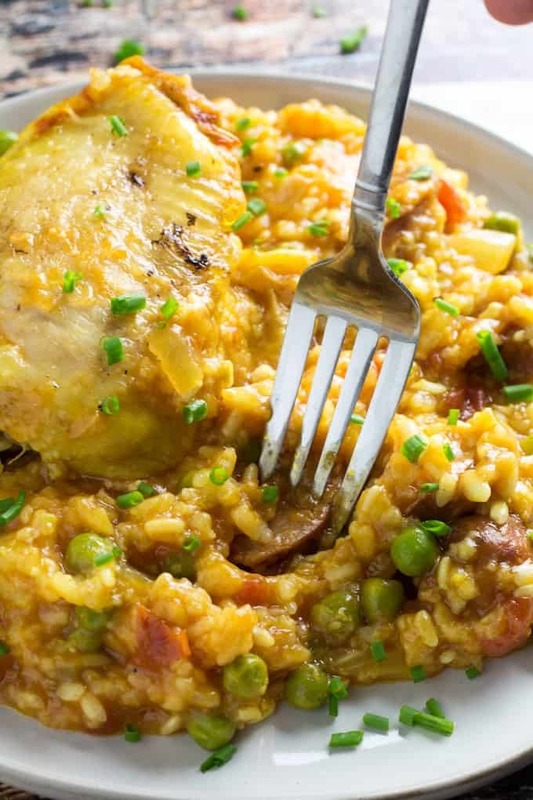 Traditional paella is a little bit different then the slow cooker version. You can use a few different kinds of rice, veggies, or meats, depending on what region you visit in Spain, and it usually contains saffron. Traditionally, paella was also cooked over an open fire. A lot of times you’ll find seafood like shrimp, lobster, or clams in paella, or even veggies like artichokes. Other times you’ll find sausage or chicken. 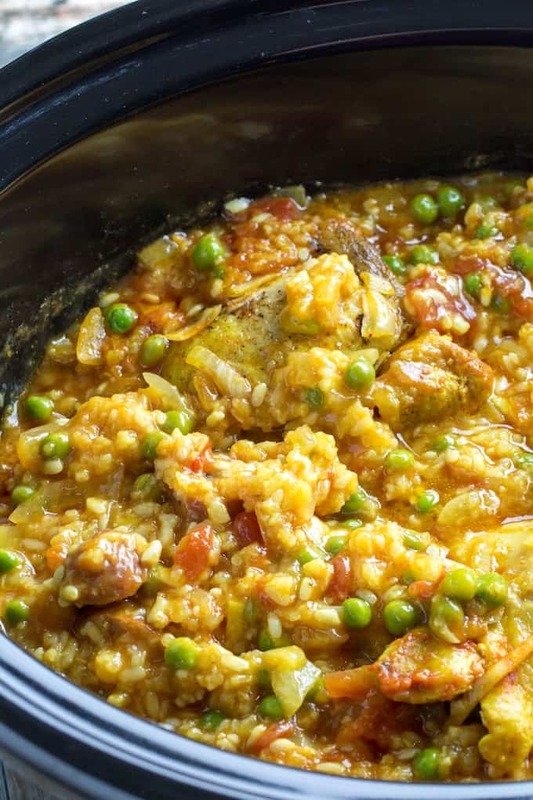 This slow cooker version is basically a quick and dirty version of paella, minus the saffron to help keep the cost down. What goes into a paella? Paella can range from chicken and sausage, to seafood, to just vegetables. Traditionally, this dish has also been served using snails, rabbit, or duck, along with beans, tomatoes, and herbs. It really depended on where you lived, and what was available. For this recipe, I’m sticking to ingredients more commonly found in your pantry. 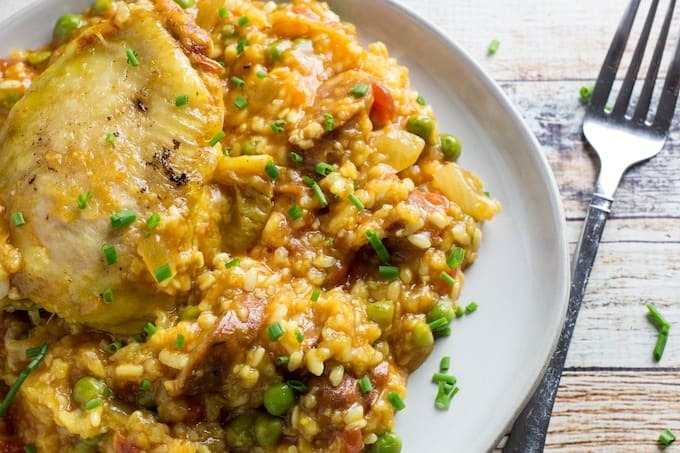 What type of rice is used in paella? Paella is traditionally made with Bomba rice, which is a short-grain rice that’s grown in Spain. Bomba absorbs more water, and therefore more flavor, than other varieties of rice. That’s what makes it so great for paella. For this recipe, I used Arborio rice, because it’s the closest I can get without having to order Bomba rice online. 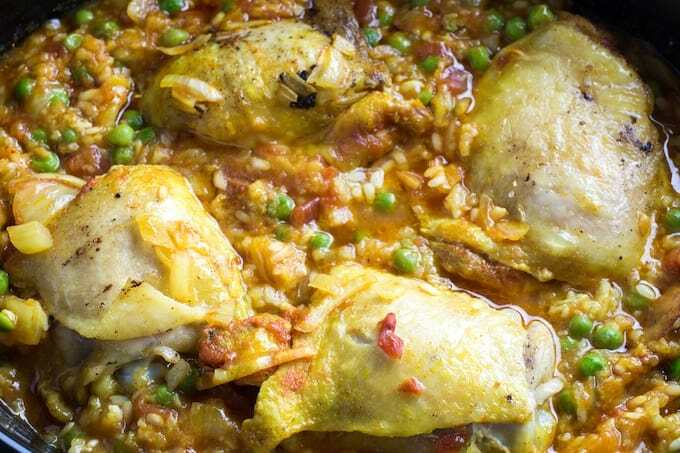 You’ll find Arborio in a lot of paella recipes for the same reason. But keep in mind that you can’t interchange the two in paella recipes without adjusting the water for that specific rice’s needs. 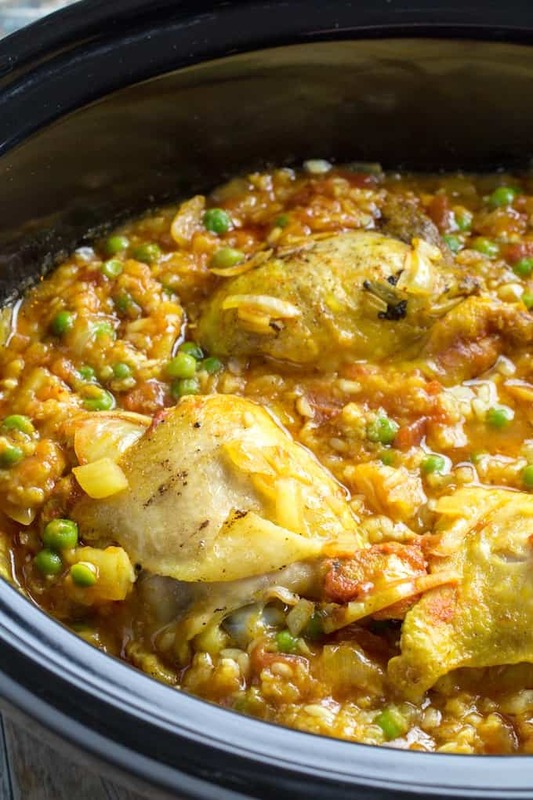 Slow Cooker Chicken and Sausage Paella is an easy dinner with a ton of flavor. Chicken thighs and spicy sausage slow cooked with arborio rice, peas, and spices. It's the perfect dinner to come home to after a long day! Add rice, onions, spices, lemon juice, tomatoes, and peas to the slow cooker and stir together. Pour in broth. Add chorizo and chicken thighs on top. Close lid and cook on HIGH for 4 hours, or LOW for 8 hours.